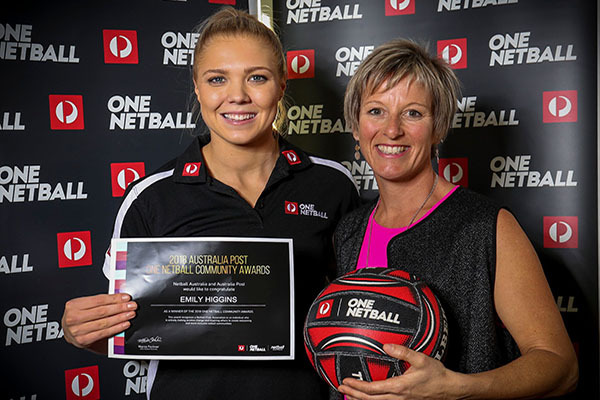 Emily Higgins from Melbourne’s East Brighton Vampires Netball Club is one of eight winners in the 2018 Australia Post One Netball Community Awards for her dedication to creating a diverse and inclusive netball environment. Australia Post One Netball Ambassador and Melbourne Vixens centre Kate Moloney stopped by the club to present the award to Emily, who is not only paving the way in the inclusion and diversity space, but played an instrumental role in the club’s establishment in 2015. Emily was selected for setting up and running a weekly All Abilities Netball program, which encourages and enables children to play and enjoy netball in a safe and welcoming environment. The program supports children with different disabilities with the aim for them to stay active and to facilitate their progress into mainstream club teams, should they wish to play regularly. “I started the All Abilities program because my son saw his sisters playing netball and wanted to join in but there was no team that could accommodate his requirements. Now, there’s somewhere for him and for kids like him, to enjoy netball and feel like they’re a part of something. We welcome any new players at any time,” said Emily. Ms Moloney said the nominations each year were inspiring and demonstrate the passion and commitment of many quiet achievers across the country. “In my role as an Australia Post One Netball Ambassador I’m very fortunate to have the opportunity to spend time with incredible people, like Emily, who work with such dedication to develop netball programs that everyone can participate in, regardless of their background or ability. It’s both humbling and motivating. “It was great to meet the young netballers at the East Brighton Vampires Netball Club presentation and learn how Emily is continuing to grow her All Abilities Netball program,” said Moloney. 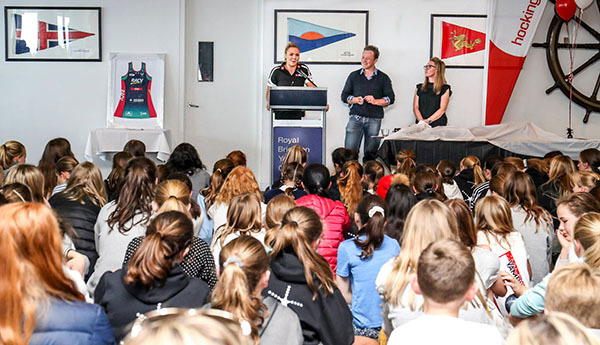 The presentation afternoon was filled with inspiration, awards and a Q&A session where the Melbourne Vixens star gave out advice to all the aspiring netballers of the Brighton club. Emily said that it was the perfect way to end the season.